The December darkness is here again. With about 16 hours of darkness for every 24 hours in the Netherlands we all long for light! As is the case in many other countries, this time of the year all Dutch cities, towns and villages are decorated with lit ornaments, brightening up the dark streets. A dad whistling “Jingle bells” to his young child while they ride in a street decorated with holiday ornaments. When I filmed a father cycling with his young child last week, he was whistling ‘Jingle Bells’ against a backdrop of such lit holiday decorations. I’ve had trouble to grasp what time of the year it really is, ever since I experienced hot summer weather until mid-October in my recent Australia trip. But this dad instantly brought me back into the right seasonal spirit and so I decided to make another ‘Tis the Season to be Cycling Video this year. Not that is ever a season for not cycling in the Netherlands, but this time of the year it does look extra festive! Filmed in the three cities that feature most on my blog, my hometown ’s-Hertogenbosch (aka Den Bosch), Utrecht and Amsterdam. With this video I would like to wish you all: Fijne Feestdagen or Happy Holidays! The season not to be cycling would be if you moved to Antarctica in July, but why would you do that? BTW at roughly what time were these shot ? Mostly between 5 and 6pm, the evening rush hour. 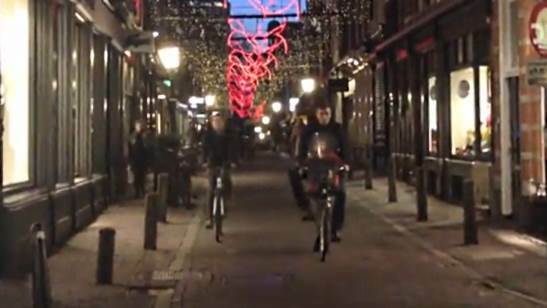 This entry was posted on 19 December 2013 by Bicycle Dutch in Original posts and tagged Amsterdam, ’s-Hertogenbosch (Den Bosch), dark, Utrecht, watching people cycling, Winter.